Mario creator Shigeru Miyamoto says that, like the recently released New Super Mario Bros. Wii, the Wii sequel to Super Mario Galaxy will be "a really challenging game." Does that warrant a little Super Guide-style help? Miyamoto tells the Official Nintendo Magazine of the UK that he "cannot tell" whether the Super Guide's hand-holding assist will be included in Super Mario Galaxy 2. But the tech will be implemented in Nintendo games "wherever and whenever appropriate." 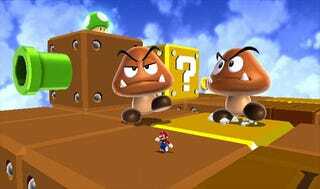 Personally, the option somehow seems more appropriate in a multiplayer-skewed game like New Super Mario Bros. Wii, even though the side-scrolling entries in the Super Mario Bros. series have typically been the more challenging of the lot. If you're on board with this Super Guide thing, are there any Nintendo titles that you think warrant it more than others?